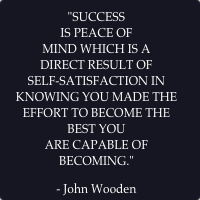 I recently watched a Ted Talk with Coach John Wooden–which was really inspiring (Did you know? The word inspire comes from a Latin word which means to breathe ~Source: dictionary.com) . Coach Wooden’s speech is filled with his old-fashioned notion of values, which is peppered throughout with stories from his own life. While it is obvious the Pyramid is meant for a team, it can also be applied toward families, marriages, and the work place. How can you apply some of these traits to your own life? I think one of the cornerstones of marriage is commitment (which isn’t on here), but a marriage can also benefit from enthusiasm, cooperation, loyalty, and friendship. What traits would you put on your pyramid of success for marriage (or partnership)? What are the traits for a great family life? Do you live your vision? Do you have a vision? 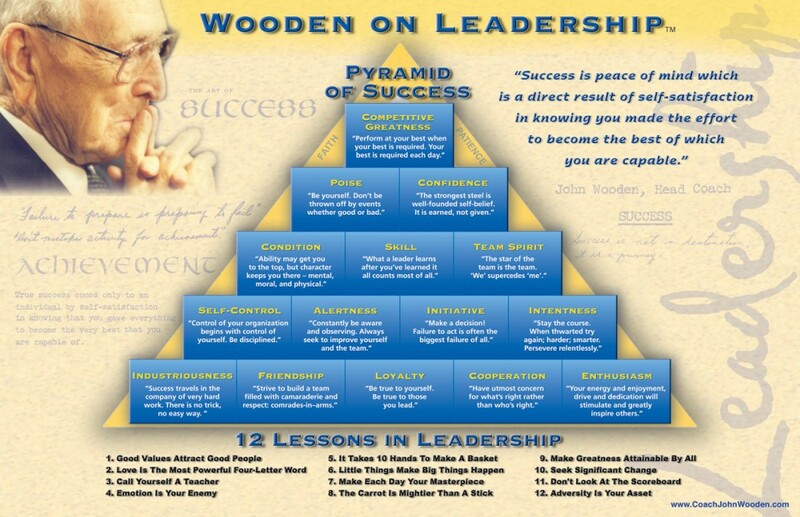 At the bottom of the Pyramid of Success are his 12 Lessons in Leadership–again geared toward a team, but these can also be translated into your real-life relationships–personal and professional. For example: #1. Good values attract good people. #7. Make each day your masterpiece. #9. Make greatness attainable by all. This week, think about how you exist in the world–what your important values are and how you’re being guided by them. Do you know what your values are for relationships, for family, or for work? Sounds like a great talk — will check it out! I love that definition of success. It’s all about the journey and the effort that goes in it makes it rewarding – or not. More often than not, it’s the journey not the destination that makes life rewarding. TedTalks are a great way to get inspired and realigned with your purpose and values. Some of the world’s greatest wisdom comes from sports coaches–I love how they see things through a team-oriented approach, much like a family. We’re all individuals but we function within groups–groups of family, community, church, school, work, etc. Instead of competition, I wish more people would begin to work from a cooperative standpoint. Anyway, I can go on and on about this, but I think the emphasis in the Western world on me, me, me instead of we is detrimental to a culture, to family, to marriages, etc.